We have a few new releases in theaters this weekend, but Tom Cruise and Mission: Impossible - Fallout will walk away with victory once again. 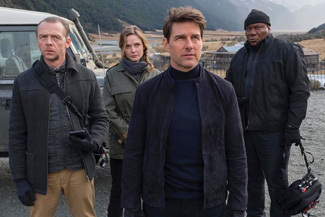 Yes, the latest film from the Mission: Impossible franchise led all comers yesterday as it earned $9.9 million. That's a 56% drop, which should even out a pretty good amount over the remainder of the weekend, particularly given the glowing reviews and word-of-mouth for the action flick. $33.6 million is a terrific result for weekend #2, and the film will be crossing the $100 million mark today (it missed by a few hundred thousand yesterday). That means second place belongs to the newest Disney film, Christopher Robin. Although it's going to land higher than where the studio itself was forecasting (they're almost always conservative), it will be ever so slightly behind tracking projections. Its $9.1 million take includes $1.5 million from Thursday previews. Even though it only sits with about a 66 percent fresh rating at Rotten Tomatoes, the target audience is totally onboard, as the Cinemascore is an A. The weekend total should be $28.1 million, although $30 million wouldn't be out of the question. Again, Disney is always conservative with regards to these things. They're one of the few studios that doesn't usually boost their totals artificially. Also new was the comedy The Spy Who Dumped Me, with Mila Kunis and Kate McKinnon. It's an innocuous enough looking film with some winning leads, but it still could only manage $5 million yesterday. $13.5 million looks about right for its weekend take, which is about as good as the studio should have expected. Darkest Minds had no studio support and appears to have been unceremoniously dumped (even though they somehow got it in more than 3,000 theaters). That lack of enthusiasm shows in its Friday total, a mere $2.3 million. I think audiences have had their fill of these types of YA adaptations. Let's call it $6.2 million for the weekend.